Hazard safety codes: F+, R12, R52/53, R66, R67. 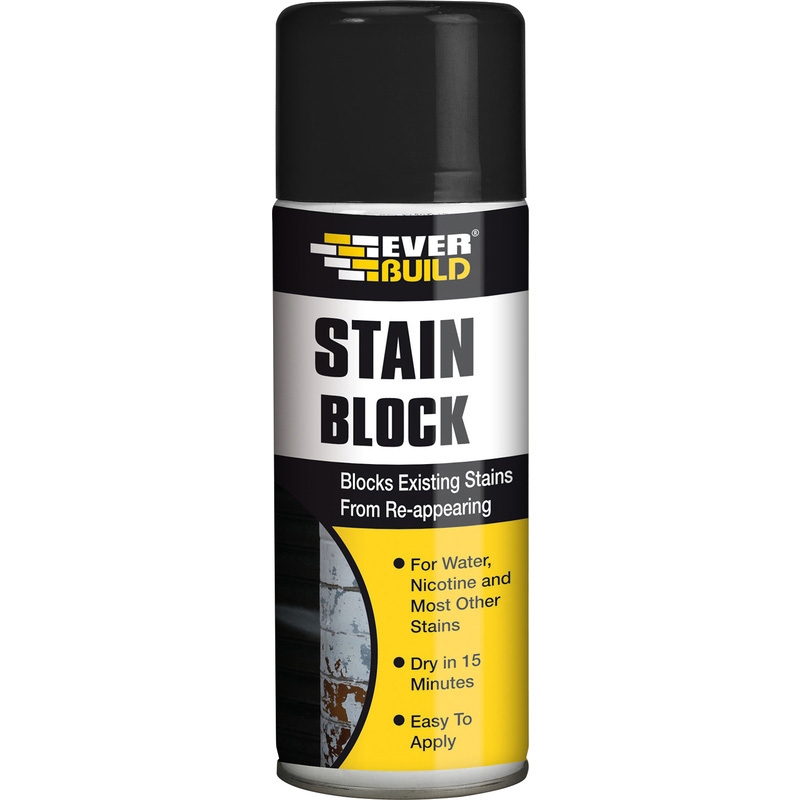 Stain Block Spray Paint 400ml White is rated 4.6 out of 5 by 61. Rated 5 out of 5 by cleansweep from Smelly! As others have remarked - it stinks so plenty of ventilation! I bought it to cover a small area 6"x4" and it covered well - lots of over-spray so mask area well. Dried quickly and I've covered in emulsion - fingers crossed!! Rated 5 out of 5 by smellienellie from Very efficient Had some really bad water stains on the ceiling of my garage, mended leak and then needed to paint the ceiling. Sprayed one coat of this and then painted and the stain was gone and so far has stayed gone! Rated 5 out of 5 by Blackrose from Perfect I had a water leak which stained my newly plastered and painted walls and roof. It took a few coats but did an excellent job of covering the stains. Make sure not to spray to close to the area and spray from side to side to ensure that you don't apply it took thick; if you do, wipe it off or use a paint brush to thin it out. The odour is very strong so you do need to have the place well ventilated. Rated 5 out of 5 by DiyDel from Perfect product Covers exactly as required and keeps stains back. Very strong smelling though so must use a face mask and ventilate well whilst using and after. Rated 5 out of 5 by Smileychris from Does the job!! I have bought this before and it saves so much time, have used it on crayon, felt tip and other stains on walls, just shake, spray, let dry and paint over, sometimes need 2 coats to paint over but worth it.